Are you working hard enough? Are you sure? What if you get sick, or have an accident? Are you prepared to go to work anyway, even if you don’t think it would be good for your health? What if your doctor and boss agree you could do something other than your usual job instead of malingering at home? Like making cups of tea all day, or cleaning the bogs, or any form of work your empoyer can dream up to force you not to take time off. Because that is now the chilling reality as the DWP attempts to inject Iain Duncan Smith’s warped ideology into the NHS. 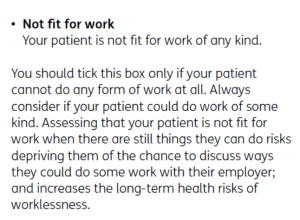 Last week the DWP issued patronising new guidance to GPs on when they should issue a Fit Note. Doctors are warned of the dangers of ‘worklessness’ and told they must consider “the vital role that work can play in your patient’s health”. Debt is at an all time high, soaring numbers of the sick are waiting on trolleys in A&E and key targets for treating cancer patients are being woefully missed. Yet as the NHS deals with the worst “cash crisis in a generation” we can disclose things are only going to get worse. A Sunday Mirror probe can reveal up to 35,000 doctors and nurses could be AXED to balance the books – which are already £2bn in the red this year. As trusts plunge into debt private firms are getting increasingly rich – with many now offering huge cash sums of £500 for NHS workers simply to sign up to websites. And Britain’s top union has warned that unless there is an urgent “injection of cash” our hospitals face their worst winter ever.